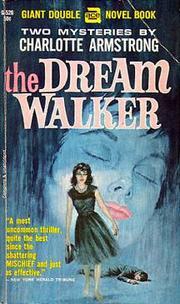 The Dream Walker is about a young woman named Olivia Hudson, a teacher at a fashionable girls’ school, aged 34. She is narrating her story into a tape recorder as a break from looking at a Portugal-shaped crack in her ceiling. And the tale she tells is a fantastic one: it is the story of a plot to bring down a well-regarded man. But how do you do that? According to Armstrong, you need a crazy plan, one so insane that even when it is exposed it is hard to believe that someone would go to all that trouble to fool people. Such a plot apparently took place. The story of The Dream Walker is a fascinating one. Charlotte Armstrong shows some plotting brilliance. From the very first chapter, you know who is in on the plot. The plot involves an apparently-supernatural element, as a young woman claims to walk around in places thousands of miles away in her dreams, and it really happens. Very few variations on this impossible trick are possible, and Armstrong wisely decides to give you the full story from the get-go. The fascination with The Dream Walker lies in how the plan is slowly executed: the noose around Marcus’ neck slowly tightens, and I spent the first part of the novel practically cheering on the conspiracy, eagerly waiting to see how they would solve their difficulties. But after a certain point in the novel, my allegiance was switched over to the other side, as I eagerly read on to see how the plot could be defeated. Please, if I am making this clear at all, please do read the fine print and the follow-up and all the hard, dry parts in the news. Don’t let your mind jump on to the next sensational headline. Oh, it’s more fun to float along, enjoying the high spots. The new murder. The latest scandal. Today’s clash. But afterwards, people have to live. And if all you remember is a vague impression of some nasty mess, and the thing that remains is only your notion that this person once fell away from the clear and unquestioned way—and to know what truly did happen is a task too dry, too hard—ah, please. It isn’t fair. I found this the most powerful message of the book, possibly due to the fact that I myself have had a personal experience along these lines—though of course nothing as fantastical as Armstrong’s tale. She conveys it so well that I don’t know where to start describing her brilliance. Maybe I shouldn’t even try—this is something you just have to experience for yourself. The plot moves smoothly along and is a terrific novel of suspense, quite possibly the finest I’ve read all year long. In particular the final act is brilliant, as everything falls apart. Mistakes occur left and right, throwing off the conspirators’ plans, and after several misunderstandings the climax of the novel is an extremely suspenseful and chilling confrontation. The Dream Walker was enthusiastically received by critics like James Sandoe (The New York Herald Tribune) and Anthony Boucher (The New York Times). Sandoe is quoted as having called it “a most uncommon thriller, quite the best Mrs. Armstrong has given us since the shattering ‘Mischief.’” I’m genuinely embarrassed that I hadn’t gotten around to Charlotte Armstrong sooner in my reading career. I had Armstrong vaguely pegged as a writer in the Had-I-But-Known school of Mary Roberts Rinehart. 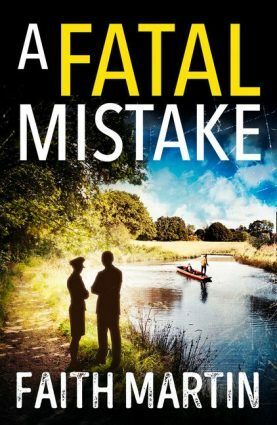 But I ask you, can you seriously blame me for this mistake when one of Armstrong’s books is entitled The Chocolate Cobweb? Charlotte Armstrong has proven once again that she could write. In my previous read, The Case of the Weird Sisters, Armstrong came up with a unique impossible crime and infused it with an eerie, surreal atmosphere that fuelled my interest right up until the end. The Dream Walker contains another impossible crime, but one to which you know the solution from the start. It is a terrific novel of suspense and an excellent novel overall. It’s an excellent rebuttal to McCarthyism and a fascinating look at how mere doubt can poison a man’s reputation beyond repair. The Dream Walker is a wonderful novel that has unequivocally placed Charlotte Armstrong among my favourite female writers, right up there with the likes of Margaret Millar and Agatha Christie. If you’ve never encountered Armstrong before, this makes for one hell of an introduction. Note to the Curious: The Mysterious Press has brought several of Charlotte Armstrong's books back into print as e-books. You can find them here. 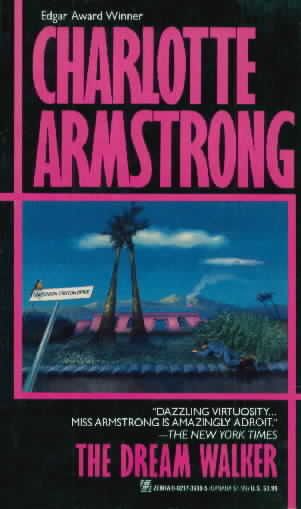 While The Dream Walker is not among them, one of Armstrong's most famous books, Mischief, is. After your first review of Armstrong, this was one of the titles I could pick up without a problem, but I refused to settle for translation, and sort of forgot about her. I guess I have to remedy that rather sooner than later. She seems to have had her own set of ideas on the impossible crime genre. By the way, if you like well-plotted persecution stories, I can HIGHLY recommend Patrick Quentin's Black Widow. One of the best efforts from the Q-team. I hope you enjoy Armstrong, though I think I've just been lucky in hitting on two impossible crime stories on both of my reads. I actually own BLACK WIDOW but I intend to read it only after sampling the other PQ series that crosses over with the Duluths.